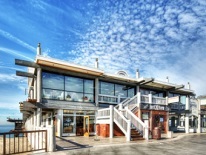 The iconic Route 66 Roadhouse from the 1920’s is now at the forefront of the Redondo Beach Pier. Having opened their sixth location, Barney’s sits in-front of the “Redondo Landing.” Barney’s Beanery has over 40 beers on tap and 140 bottles to wash down their World Famous Chili. Where else can you order a Chili Sampler? Barney’s Beanery is packed with TV’s, so it’s fast become a popular spot as well as a solid place for breakfast, lunch or dinner! Wild Wednesday; Buy one Barney’s Specialty Cocktail, get the 2nd for $1. Thirsty Thursdays; $6 25oz mugs of Barney’s Brew, Coors Light, Bud Light, PBR and Rolling Rock. Fun Friday; $5 Barneys Burger with fries and $4 Bud, Bud Light and Michelob Ultra Aluminum Bottles.